The first figs on our Celeste bush started turning maroon a couple of weeks ago, and ever since I've been waiting with baited breath, hoping to taste a new fig variety. Unfortunately, cool weather has slowed down ripening considerably, and the only summer plants that are still bearing like crazy are our red raspberries. The Celeste fig seemed to be stuck halfway ripe. With another potential frost forecast, I decided to see if those Celeste figs were tasteable. I plucked the fruits off the bush, cut them open...and was disappointed to see colorless flesh inside. 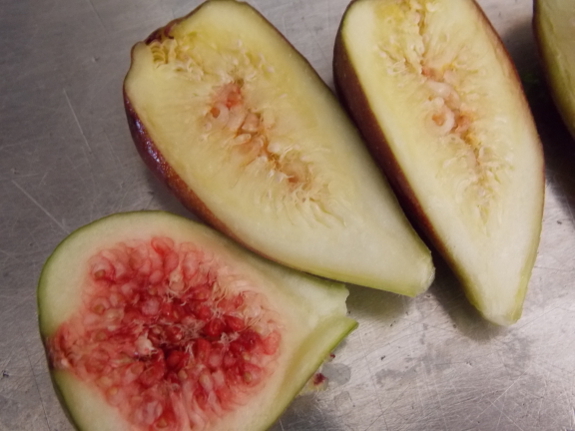 Unlike most fruits, the telling color-change on a ripening fig occurs hidden inside --- in the photo above, the fig on the left is a ripe Chicago Hardy fig for comparison. I guess we'll have to wait until next year to taste a ripe Celeste fig! 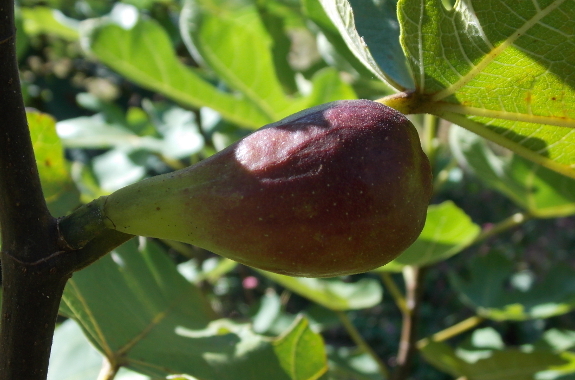 In the meantime, I should note that despite last winter's cold killing our Chicago Hardy plant to the ground, we've still enjoyed perhaps a gallon of figs this year. That harvest doesn't hold a candle to last year's bounty, but it's not bad for a tree that started from the ground up this spring!